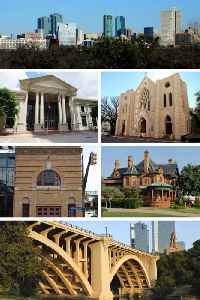 Fort Worth is a city in the U.S. state of Texas. It is the 15th-largest city in the United States and fifth-largest city in Texas. It is the county seat of Tarrant County, covering nearly 350 square miles (910 km2) into four other counties: Denton, Johnson, Parker, and Wise. According to the 2017 census estimates, Fort Worth's population is 874,168. Fort Worth is the second-largest city in the Dallas–Fort Worth–Arlington metropolitan area, which is the 4th most populous metropolitan area in the United States.